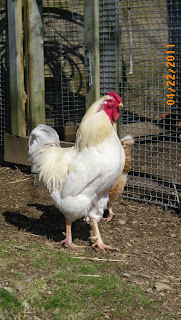 Spring Peeper Farm: A week in photos. 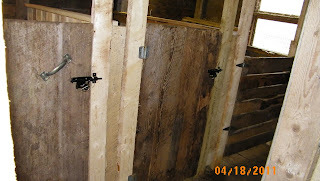 Dave has rebuilt the stalls. They are now 3 even sized stalls. A lot better for the goats. He also went to the cattle sale last Saturday. He found me a nice buggy for bringing my bales of hay or what have you around. It's in excellent shape. Then Sunday evening we had a pre-Easter service. We had a few people from other churches come and sing also. 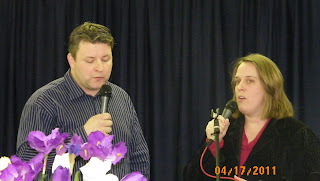 Becky and Chris sang from our church. They sang beautifully. Gave me goosebumps. 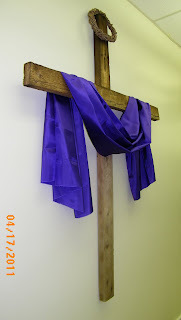 This cross actually survived the church fire. 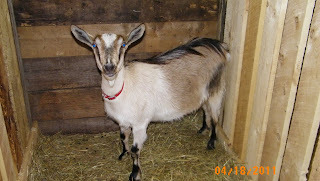 Well I know that Cindi Lou is due this weekend, but honestly, does this goat look pregnant to you? Nope. If she has a baby I'll eat my shirt. But who knows? She's not even showing signs of kidding. No pawing the ground, no nesting, no jitters. Nothing, nada. 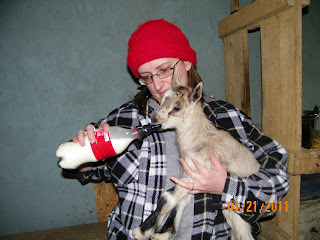 Febe was due on the 21st and she actually gave birth on the 21st! That's a first! She's always late. So she had a girl and a boy. The girl is small, so I've been supplementing her a bit. We named the boy Oreo. The girl is Spring Peeper Azelle Marie. The reasoning behind this name is simple. An elderly friend of my mom's was not well. So I told her that I'd name a goat after her. She was thrilled. Then she passed away a few weeks ago. Azelle Marie was her name. Azelle looks like a mini donkey. She's a sweetie. 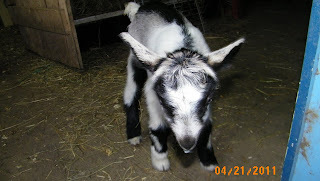 Oreo, well, he just has weird markings. 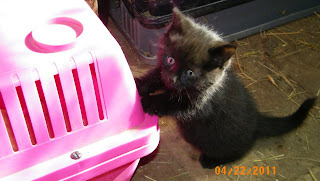 We've also been on the hunt for new barn cats. Well we found 2 brothers. J. named them Sylvester and Junior. Really original. Honestly it's hard to tell them apart. Junior has one white toe on his back leg. I think we're kinda cute! J. got a gift from grandpa for Easter. A pellet gun. It's pretty cool. I wasn't too keen on it at first. We're not really a gun family. Well, it might be spring but man it doesn't feel like it. I have yet to put clothes on the line. It's too cold! The temps are not bad, but the wind is biting. It's bitterly cold. If the wind would die down it wouldn't be too bad. We're still making fire in the furnace like if it was January for crying out loud! The eggs in the incubator didn't make it. Two hatched but the chicks would die soon after. I don't know what the scoop was on that. They were a week late in hatching. I don't know if at one time the temp dropped in the incubator and I didn't notice. But it's all very discouraging. I hope you liked the week in photos. Well that's what it seemed like anyway. Have a Happy Easter and a Blessed day! Great week in review! 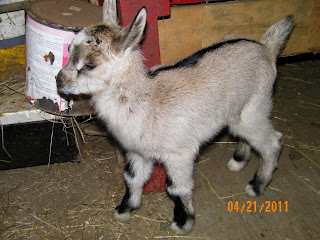 Love the baby goats! 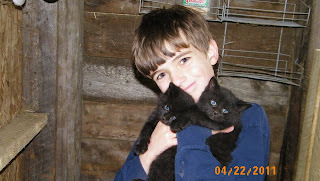 I love the baby goats and the kitties! So sweet. 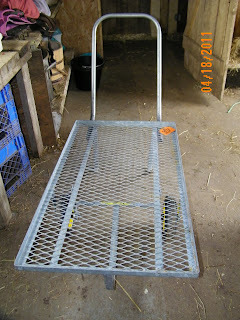 Love the barn buggy! How practical. We've been using a wheelbarrow, but I think your buggy will be all lot easeier to maneuver. Sweet baby goats and kitties. Hope your family has a nice holiday!